Roof Structural Engineers: Walter P. Moore & Associates; Roof Structures, Inc. The first American covered superstadium opened in April 1965; later that year the Reverend Billy Graham held an evangelical meeting under its steel, lamella-truss roof and called the Astrodome "the eighth wonder of the world," an epithet Houstonians continue to embrace with pride even if many subsequent stadiums have surpassed theirs in size and efficiency. Estimates of its final cost range from $45.35 to $48.9 million in 1965 dollars. The Astrodome covers a 150,000 square-foot playing field with a domed roof 642 feet in diameter. Setting a precedent that continues to this day, most of the funds for its construction were public, in this case local bond issues, while a private individual profited most from its successful completion. The Astrodome was masterminded by a colorful Houstonian named Judge Roy Hofheinz (d. 1982), who in the early 1960s paid $5 million for 495 acres of swampland 6 miles south of downtown Houston, spent $1.2 million to drain it, and then sold 180 acres to Harris County for $5 million, retaining the remaining 315 acres to develop into the privately-owned complex that today contains a hotel, a convention hall complex, and the Astroworld Amusement park. Using his political influence (he had been a county judge, mayor of Houston, state legislator, and Lyndon B. Johnson's campaign manager), Hofheinz induced the Texas highway department to accelerate plans to build Loop 610, which today borders the site. Meanwhile, he bought a controlling portion of shares in the Houston Colt .45s, an undistinguished baseball team which had been franchised in 1962. He changed the team's name to the Houston Astros to honor the recent arrival of NASA's huge manned spacecraft center, which would put a man on the moon in 1969. Hofheinz claims to have been inspired by the velarium unfurled by Roman slaves in inclement weather to shield wealthy visitors to the Colosseum, claiming "if those Romans can put a lid on their stadium, so can we." 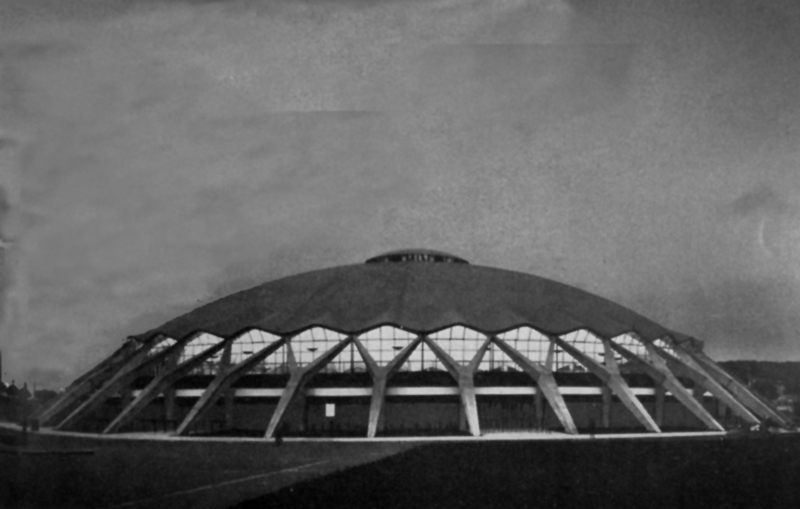 A more proximate source of inspiration was Pier Luigi Nervi's concrete lamella-trussed, multipurpose Palazzeto dello Sporto in Rome (1957, figure 1), which Hofheinz had seen in a recent issue of Sporting News. A covered stadium, he claimed, would put Houston on the map: "nobody can see [the Astrodome, then under construction] and go back to Kalamazoo, Chicago, New York, you name it and still think this town is bush league, that this town is Indian territory." Many of the changes in American sports that became more visible with the construction of subsequent domed stadiums were intimated in the configuration of the Houston Astrodome. A round, multi-use structure that departed from the diamond shape traditional to older baseball stadiums, the Astrodome lacked the idiosyncratic architectural features and connections to surrounding topography that made each older stadium a distinct place with its own character. The resulting sense of placelessness was exacerbated by the designer's embrace of the latest developments in electronic media. 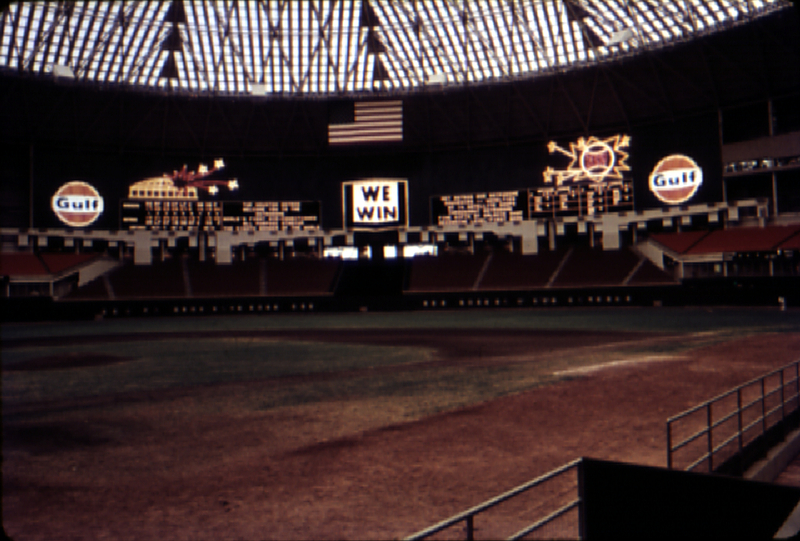 The Astrodome was the first major-league stadium equipped with adequate lighting for color television, and its 60-by-300 foot-long electronic scoreboard (figure 2) provoked critics to complain that American sports fans were being transformed unawares from active psychological participants in a local game to passive recipients of a big-business entertainment spectacle--Roger Angell, the sports writer for the New Yorker, noted early on that viewers in Houston watched the screen more often than they did the game. Finally, the Astrodome, like all subsequent stadiums, included "luxury boxes" that sequestered the rich in carpeted rooms behind plate glass, duplicating the class stratification of American society that had been levelled in older stadiums as rich and poor alike sat in uncomfortable bleachers in the rain, shouting for the home team. As for the Astrodome's effect on Houston, the stadium has lost money virtually every year since it opened but nonetheless was always considered a success. A year after opening it became America's third-most-visited man-made tourist attraction, behind only Mount Rushmore and the Golden Gate Bridge. It did become the anchor for the subsequent development of south Houston, and some economists estimate that, when the "rollover effect" (dollars brought into an area by economic investment, then respent locally) is taken into account, the Astrodome brought profits to the city in excess of $4 billion. Angell, Roger. "The Cool Bubble." In The Summer Game. New York, Viking, 1972. Kammer, David John. "Take Me Out to the Ballgame: American Cultural Values as Reflected in the Architectural Evolution and Criticism of the Modern Baseball Stadium." PhD. Dissertation, University of New Mexico, 1982. Karp, David A. and William C. Yoels. "Sport and Urban Life." Journal of Sport and Social Issues. (*): 77-102. Leerhsen, Charles. "Happy Birthday, Old Dome." Newsweek (15 April 1985): 11. Lipsitz, George. "Sports Stadia and Urban Development: A Tale of Three Cities." Journal of Sport and Social Issues 8, no. 2 (19**): 1-18. Ray, Edgar W. The Grand Huckster [biography of Hofheinz]. Memphis: Memphis State University Press, 1980. Various newspaper articles in The Houston Chronicle and The Houston Post.